DUBLIN are through to the semi-finals of this year’s Walsh Cup with a 4-16 to 0-17 win over Antrim in Parnell Park today. Pat Gilroy’s team, 11 of whom were involved in heavy challenge match defeat to Tipperary just 24 hours previously in Thurles, started sluggishly and trailed their fellow Division 1B side by 0-5 to no score after seven minutes, chiefly through the free-taking of Neil McManus. Goals from Paul Crummey and Paul Winters settled them, however, and Dublin went on to lead by 2-9 to 0-9 at the break. In the second-half, Alan Moore – who was centrally involved in Winters’ goal – got two of his own, and the St. Vincent’s man finished the game with 2-1. Robbie Mahon, who played in the opposite corner, pitched in with 0-6 as Antrim were left to rely heavily on McManus’ accuracy from placed-balls. Dublin will face Davy Fitzgerald's Wexford back in Parnell Park next Sunday in the competition’s semi-final. 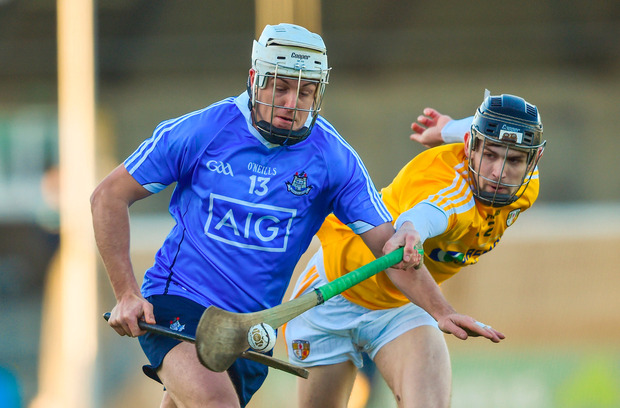 SCORERS – Dublin: P Winters 1-4 (0-3f), A Moore 2-1, R Mahon 0-6 (2f, 1’65), P Crummey 1-1, D Gray 0-3, J McCaffrey 0-1. Antrim: N McManus 0-11 (10f), C Johnston 0-2, N Elliott, G Walsh, C McCann, C Clarke (f) 0-1 each.